Physiological changes associated with mTBI that may facilitate biomarker discovery for this type of injury. Disruption of the blood-brain barrier (BBB) in response to mTBI may increase concentrations of brain-specific molecules in circulation, and evaluation of serum concentrations of these molecules may benefit mTBI diagnosis. Astrocyte-specific proteins, such as SB100 and GFAP, are found at high levels in the brain, and the presence of these in blood may indicate loss of BBB function or injury. Several neuron-specific proteins, including NSE, UCHL1, and PrPc, may be released from damaged neurons and could enter the blood if BBB integrity is compromised. Additionally, NFs can be released as the result of traumatic axonal injury. The presence of oligodendrocyte-specific proteins, such as MPB, in serum may also indicate mTBI. The presence of serum albumin, which is found at high levels in blood, in the CSF also indicates a breach of the BBB. 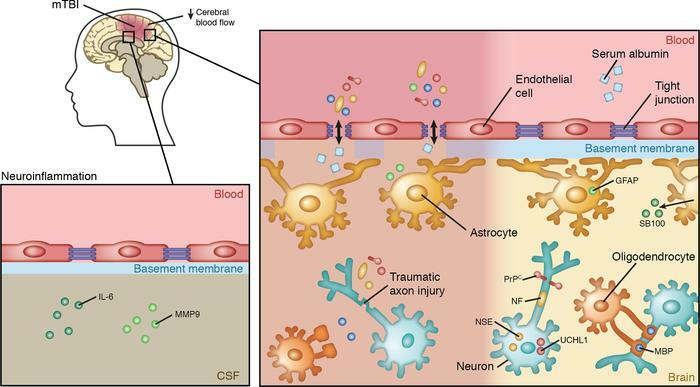 Neuroinflammatory molecules, such as IL-6 and MMP9, in the CSF may also have potential to evaluate the extent of mTBI. Neuroimaging may also be useful, as CBF has been found to be decreased in some cases of mTBI.